Rupali Bank Limited has invited application for the post of "Officer-Cash". Applications are accepting by Online application system. Total vacancies are 328 positions. Candidates must be a citizen of Bangladesh. Candidates age limit must be 30 years by 01 July 2017. Requirement qualification should have Post graduation degree or 04 years graduation degree. 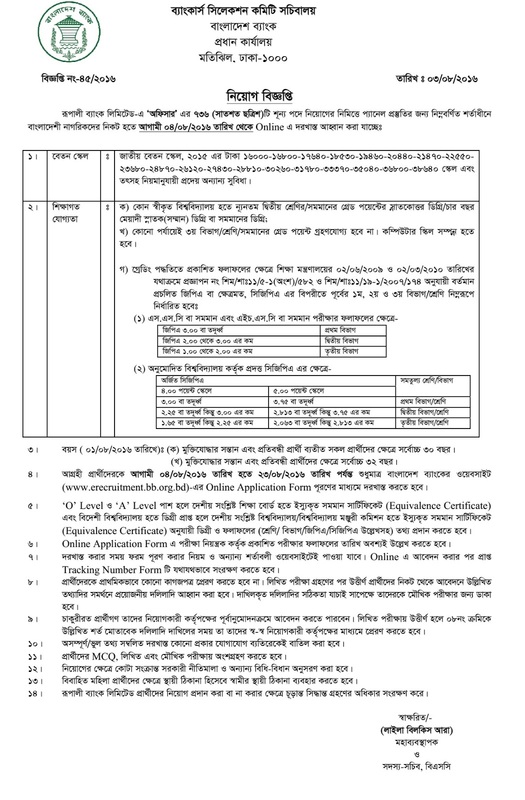 Applicants can apply Bangladesh Bank erecruitment system. Click apply Now button and submit your application form. Online application has been start on 17 July and it will be continue on 31 July 2017. After completing the application candidates will able to get the admit card when they issue. Applicants must be see details information before sending application. Details circular is given below attached.